Rome is an ancient wonder. It feels strange, walking along a street next to the heart of the world city, but surrounded by old ruins. Here the old survives next to the new. There was extensive damage done by the Vandals, the people who overran Italy in the 5th century. They cut off the water supply, and that alone left Rome defenceless. Much of that which now survives owed its remains to the lack of water which made the hills of Rome unattractive to live. But much is in ruins. The Colosseum is among the lucky ones: some three quarters survives and only one side has collapsed. But this wasn’t done by the Vandals or any of the invaders. Earthquakes are to blame for the vandalism. But in fact Rome isn’t an earthquake zone. Its location is well chosen, and the Earth here is, unlike the political arena, stable. The problem is, as so often in Italy, the neighbours. 60 kilometer to the East runs the Apennine mountain chain, and here there are earthquakes. It is the distant echoes of these quakes which so damaged the Colosseum. Exactly which earthquake destroyed which part is hard to tell. There were damaging events in 346 and in 847 AD, but the worst may have been in 1349. Italy has a mountainous spine. There are three separate mountain chains, together spanning the length of the country from the Po valley in the north to the southern tip opposite Sicily. The northern Apennines run northwest-southeast, the central Apennines follow Italy’s spine and the southern Apennines bend towards the west. Geologically, this is a young mountain chain, younger than the Alps. Most of the mountain building happened during the last 10-15 million year. The youth has made them rugged: erosion has barely gotten started. It is a continuation of the Atlas Mountains of Morocco: in geology, Italy has never lost its African heritage. The central Apennines are the highest, reaching close to 3km height. The mountains can bring relief of the summer heat, and attract more rain than the coastal plain. There are many small towns in the hills, and more populated cities in the wide river valleys. Italy is in a precarious position. Originally a fragment of Africa, it separated from that ancient continent and became part of the first wave reaching Europe, part of the closing of the Tethys ocean. The collision pushed up the Alps. Africa is still trying to move north, but now Italy is caught in the middle. And the motions became more complex. The Italian mainland is moving northeast, towards the Adriatic. Behind, in the west, Corsica and Sardinia are European. In front, the Adriatic foreland is part of the African plate. Italy remains the battle front, between armies that in some ways have gotten lost in the land and occupy unexpected territory. The three different Apennines are part of this complex motion. They are thrust-belt structures, but with different origins. The northern Apennines are related to the Alps, the movement towards Europe. The central Apennines come from the movement towards the Adriatic Sea, and the southern Apennines formed due to the approach of Africa. All these movements caused the rise of the Apennines along the spine of Italy. There may be a subduction zone associated along the Adriatic but this is not certain. The push towards the Adriatic ended a few million years ago, when the sea on the west, the Tyrrhenian basin (between Italy and Corsica) began to widen. East and West are moving apart and Italy’s peninsula is being stretched. Stretching does not build mountains, in fact quite the opposite. Thus, the Apennines no longer grow and have started sinking: it is this deflation which is at the heart of the modern earthquakes. All along the mountain chain, volcanoes formed. The northern ones are believed extinct but activity in the south is continuing, from Naples to Sicily. Here are some of the most famous volcanoes on Earth: destructive Vesuvius, playful Stromboli, iconic Volcano and towering Etna. Vesuvius is just the most recent expression of a wide weakness, perhaps caused by the extension of the Tyrrhenian. Over the past few million years, the volcanoes have been following a graben structure on the western side of the Apennines. Along the entire Apennines runs a fault. It is not a single fault but a large number of parallel ones. They are related to the sinking of the mountains, and are mainly dip-slip events with movement perpendicular to the mountain chain. Typical slip rates are 1-2 mm per year. The earthquakes along the Apennine fault reach up to M7, and can be highly damaging. The typical depth is 10-15 kilometer. The earthquakes often come in sequences. An example is from 1703, when the sequence began with an event at Norcia, on Jan 14. The second event was a bit further south, at Montereale. Finally, L’Aquila was hit on Feb 2. All three quakes were M6+, with the largest one last at an estimate M6.7. All happened within 40 km of each other. 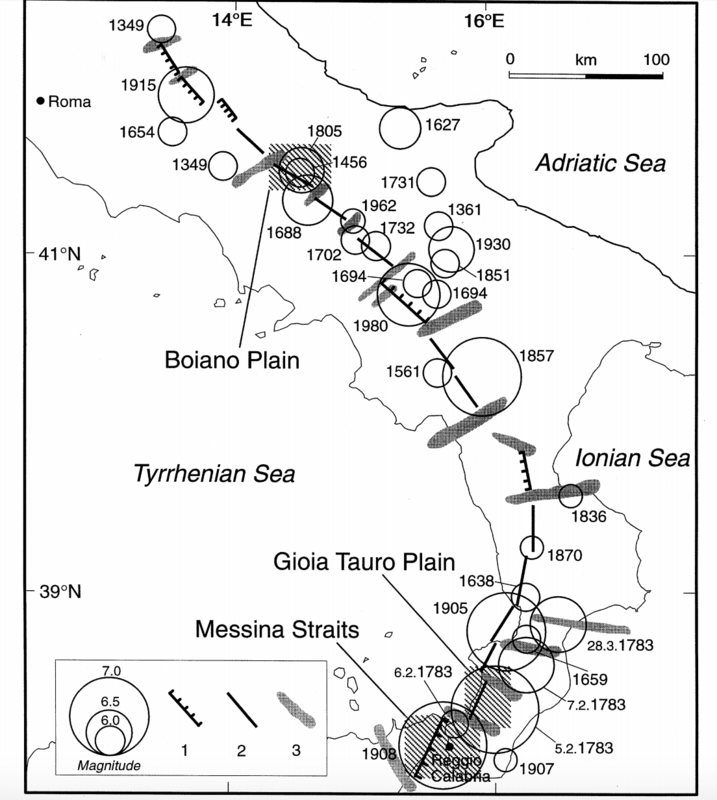 In 1783, a sequence of 5 quakes hit the southern Apennines, within 2 months in February and March. The quakes may happen along the same fault, or may be on neighbouring ones. Each quake affects the stress on the surrounding region. The main ‘quake belt’ is only around 30 km wide but hundreds of kilometers long, and with many parallel faults. East of this is an a-seismic belt. In the quake belt, there is little indication of the faults at the surface: any remains are quickly removed by the intense agriculture. Finding the faults is a major research area, and there is considerable uncertainty about which quake was caused by which fault(s). Major quakes are frequent: there have been at least 60 earthquakes of M>6 over the past 2000 years, with as many as half of these reaching M6.5. Historical earthquakes along the central and southern Apennines. Among the most destructive events is the triple quake of September 1349. It occurred fairly close to Rome and did major damage to its ancient buildings. One of the events had an epicentre near the oft-hit town of L’Aquila. The damage of Rome was one of the defining events of the Middle Ages and it was widely reported in the various sources. This was the time when the southern outer ring of the Colosseum collapsed. The current sequence began in April 2009, when L’Aquila (who else?) suffered a M6.2 event. The next one was a surprise: in May 2012, two earthquakes of M6 and M5.8 struck north of Bologna, in a region not considered particularly at risk. This is at the northern end of the Apennines, in the plains. The sedimentary plain turned out to be hiding the faults. 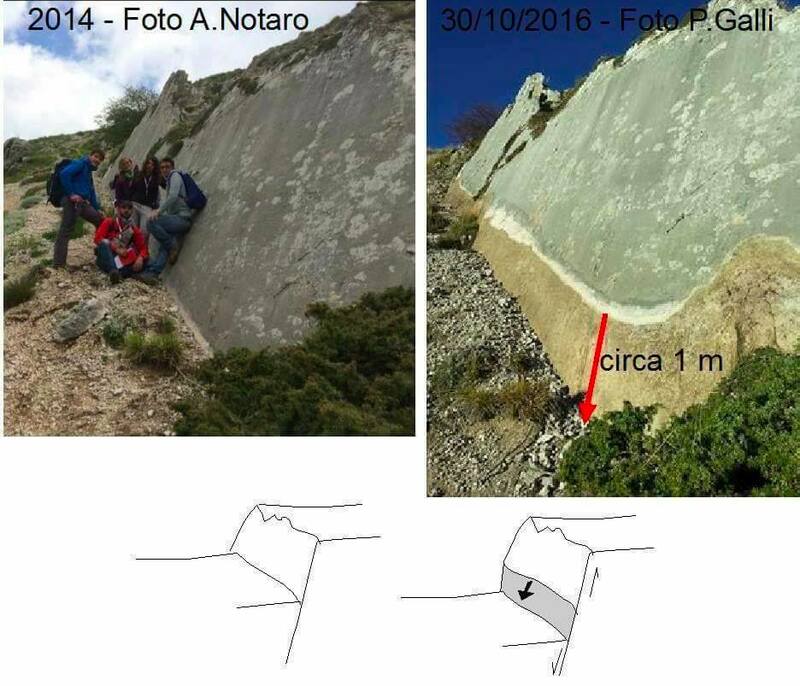 24 August 2016 an M6.2 hit Amatrice, 26 October a double event in Visso, and finally 30 October an M6.6 hit Norcia. Hopefully the sequence will end here. But the earthquakes in Italy will not stop. It is part of the fabric of the country. Very interesting. Also interesting to read that Rome itself does not sit on an earthquake fault. A long series of corrupt and / or inefficient mayors are destroying Rome as the Vandals. A few days ago I read a recent study on the GPS measurement of displacements of Italian Peninsula: Contemporary crustal velocity field in the Alpine Mediterranean area of Italy from new geodetic data – http://link.springer.com/article/10.1007/s10291-015-0481-1 (free access). Great post Albert. Hope people are alright in Italy. About all I can say is that the Christmas lights visible along the east side of the Messina straights are one reason I retired. Nothing quite as depressing as seeing that on deployment. Quite pretty, but not something I enjoyed looking at. I hope this sparks the end of unreinforced brick building. It is time that unreinforced houses are rebuilt and reinforced, or just plain torn down and built anew. Because as you point out, it is not a question of if, it is a question of when. But, but, how is the construction mafia going to earn money then? But things have improved. Past earthquakes of similar strength caused tens of thousands of casualties. Buildings suffered but in comparison to the damage, people came of better than could have been the case. In this last quake, the sequence of events helped, as the foreshock caused people to leave their houses. But even the first one, where there was no such warning, had a lower human cost (this sounds awful when talking about lives). The epicentre was destroyed, but further out much survived that in the past would not have. Also, the quakes took place in an area that is not very densely populated. Still, there are over 15,000 people who are now homeless because their house is destroyed. Is this part of the Domino affect of the plate boundaries ? Probably not, earthquakes of that size in that region is pretty common. And when people talk about there being chain effects in situations like this they mean that the next faultline over could go off, or other local faultlines. Not that it would set off earthquakes a tectonic region or two away. Could this stretching that underlies all the current quakes and originates the cascading effect, also create new faults? Technically it could, but that is uncommon. It would more or less imply that stress has been built up and is not able to be released by pre-existing faults. The first of the quakes was on a sprungur that does not belong to Hekla, the second one was a true Hekla quake though. And just to remind everyone. Campi Flegrei has previously uplifted meters without erupting. Nothing has really changed in the area, and nothing is pointing towards an eruption being immanent. Hi! Yes the vulcanologist didn’t say that. The thing that i thought more interesting and is worring them is the “important variation in the chemical composition of the fumaroles of Solfatara and Pisciarelli”… the good news is that they are monitoring it very closely. Yes, the INGV is very good. And Boris Behncke has not bribed me with cheese to say that (I do hope he will though). What has happened is most likely that the pattern of motion for geothermal fluids have changed so that more chemically rich water is entering the system bringing with it more charged gases. Even though it is not a volcano that is threatening to erupt right now, it is a volcano to monitor well. Also, Ischia next door is something to keep track of. The area is known for slow inflation and deflation cycles of a meter or more. It is caused by the circulation of underground water (hydrothermal). That could also affect the fumaroles, I guess. No indication of an eruption, but obviously the area is very well monitored. “Normal” uplift is 280cm in a year, and then deflating almost all of it in a decade. That was just water. It is when you see 7 meters of uplift in 48 hours it is time to run into the hills before you become part of a new hill, because that is magma intruding at shallow depth. People have a tendency to underestimate the “normal” for a very large caldera. They compare it to say for instance Grimsvötn and its 11cm in 15 days and go “oh”… and forget that a large caldera can literally tip a house on its side in one night. And in a few centuries you can get Ischia to Uplift 700 meters and Sakurajima was not even above surface when Columbus was putsing around. Sakurajima was definitely above the surface and pretty well built-up when Columbus was around. It’s been a feature of the Aira caldera for over 10,000 years, with a VEI-6 somewhere in the distant distant past. The Kitadake crater, a crater somewhat similar to Minimadake and Showa stopped erupting over 4000 years ago to give some perspective. Iwo Jima makes more sense. Was going to say, figured you would know that one haha. If Iwo Jima doesn’t give anyone the willies they need to learn more volcanology! I hadn’t heard that. That fits with the deflation origin of the quakes. Here is the drop in question, one side of the fault dropped a meter. Thanks for pointing that out. I detest flavored coffee. Straight up dark roast, potentially capable of being ambulatory in it’s own right, and I’m happy. Well… I would be happy, provided that I hadn’t cut back on coffee altogether. I have a hard enough time with my circadian cycle as it is. Mine disappears altogether if I do not get my morning coffee. Black, straight up, warm and with a lot of natural flavour. The italian scientists just sayed this quake sequence was similar to the big quake sequence of 1703. Meanwhile, good luck to you all in Italy. Since I enjoy being a contrarian, I want to also point out that GPS signals often are nonexistant or very quiet prior to eruptions, and they often only really make noise in the very brief time before all hell lets loose. The biggest eruption in the last 100 years (Pinatubo) had very little GPS change before letting loose its VEI-6 blast. The way I tend to look at it, I see that there are two types of common GPS change at volcanoes strictly due to magmatic processes. The first is very subtle, gradual, and may be hard to pick up. This comes from the extremely slow and gradual filling of a magma chamber. Since many volcanoes do this over the course of hundreds to thousands of years, it’s pretty difficult to pick up. Also, GPS changes don’t necessarily pick up assimilated crust, as a volcano that simply melts the nearby crust and adds that magma to its molten core won’t register this as inflation since the rock was already there. Typically, inflation of this nature (depending on the volcano’s size) will span a pretty wide region as the inflation comes from a deeper source, and is not contained within a narrow conduit. Think of this as our favored pillow pushing up from below analogy. The second type is more commonly associated with the lead up to an eruption, or failed eruptions. This inflation is often rapid, quite intense, and contained within a pretty small area. Pinatubo experienced this briefly before letting loose, and Mt. St. Helens is a famous example of this occurring (with huge changes due to the cryptodome pushing up through the narrow conduit). Hakone had an instance of this earlier this year, although it’s tough to say if this was a result of hydrothermal changes, or if there was a finger of magma pushing into the crust above the magma chamber. The problem, is that when you associate other factors such as Hydrothermal activity and Tectonic activity as we see in iceland, things get very tough to know what is going on. Also, there is the simple fact that even accelerated GPS change will stall as the intrusion in the upper crust can relieve pressure by itself. You do not get any big protests out of me. Same is true also for earthquakes at a volcano. They can putter at a regular “rhythm” indicating steady pressure build up, it can come in bursts indicating intrusions, or it can be quiet. Just looking at one single source of information is just a very good way to get confused. Firstly you need to know the volcanos history, the instrumental record weigh all data and make an educated guess. Some activity in Momotombo this past night.. Some? I think that was the understatement of the year. And still no eruption. That volcano is crazy, all instruments tell us that it is happily erupting. But, last evening just before dark it produced a 3km high steam column. At the moment there is also a quite strong glow from the summit visible on the webcams. I know it has been glowing the whole time, but I think it looks a bit more intense at the moment. One of the webcams just switched from B/W to color and then the glow disappeared. I take it the fumaroles are hot, but not hot enough to be visible to the human eye. B/W mode is probably infrared. That’s why it seems to be glowing at night. Nevertheless, the glowing did seem to be more intense than before. The glow has slowly been building over the last month as the temperature increases. Carl / other Volcanocafe regulars, how do you interpret this situation? I get the impression something larger than normal is trying to move from a deep magma chamber to a smaller upper chamber, but is too blocked to do so effectively. What strikes me as strange here is that this is an open-vent volcano that just erupted not that long ago. Normally, with volcanoes like these, if a little bit of pressure gets built up, it will get released with relative ease since the upper conduits aren’t blocked up and solidified. But as we see now, even with vigorous seismicity, nothing seems to be getting released. Also, I’m not a fan of how close Momotombo is to lake Managua. The previous three blasts was a phreatic throat clearing. It probably opened up conduits to rather vigorous aquifers going from the lake in under the volcano. So, much of the signals is probably from a rather stupendous hydrothermal activity going on at the base of the volcano or slightly below it. There is though signals that point more towards magma movement, but it seems to be slow going. In a way it reminds me of Kelud. There are obvious differences, Kelud coughed up a large lava dome and then continued to rumble ineffectively for a couple of years before going nuts on us. It is the continued rumbles that reminds me of Kelud. Still, judging from the amount and longevity of precursor signals this feels like it will be a memorable event from a volcano that has a record of doing many different styles of eruption. Can anyone explain the sustained tremor on the MOM2 live signal? Hydrothermal fluid running up the system and that is in turn expelled as steam. Momotombo is basically a steam engine and it is a noisy one at that. That would make a great supervolcano or magma field. 1km by “hundreds” is quite a lot. 1x 20×20 is 400km^3 alone…. which ‘that’ are you refering to ? Now one should know that the APVC magma reservoir cited is not a magma chamber at all. It is a batholit feeding individual magma chambers above it across a large distance. That being said, the APVC is host to the largest known collection of VEI-8 eruption calderas on Earth and it hosts one of 4 centers that is behaving in a manner of charging/recharging for a large caldera event (Uturunku). The other 3 are of course Aira, Atitlán and Iwo Jima. If we ever see a VEI-7 eruption in our time, I sincerely hope it occurs in the Altiplano, as it’s one of the most remote areas in the world, and would likely have a comparably minimal impact on human life there. The other 3 prospects would be scary enough if they had a VEI-4 sized eruption. Anything larger becomes a nightmare scenario. One of my “favourite” VEI-7 eruptions is Aniakchak. And even there it had a large impact around the northern hemisphere. At that size there is only bad and even worse when an eruption occurs. People tend to say things like that we are having a lot of eruptions now, but as you know that is not true. We have for quite some time lived in one of the least volcanically active periods in the history of mankind. The last correctly assigned VEI-5 eruption was Mount Hudson in August of 1991. Same goes for VEI-6 with Pinatubo in June of the same year. So, currently there has been a 35 year hiatus on medium-sized explosive eruptions. And as most people know there are roughly ten VEI-5 eruptions and about three VEI-6 eruptions per century. My point is that sooner or later we will get one of those in our lifetime. A VEI-7 would be moderate unluck wherever it struck and a VEI-8 would be in the range of winning the lottery. I think you meant 25 years, unless I’ve somehow time travelled to 2026! 😛 Anyway, I just read that the 1933 Cerro Azul eruption was just 0.5 cu km short of VEI-6, so that’s almost 4 of those in the space of 50 years! (1883 seems to have been a ridiculously productive year). I suppose you could say there was a mini-uptick from 2008-11 with 9 VEI-4s of course including the two almost-5s in 2011, but now we’ve only had 2 4s in the last 5 years. It would appear to be likely that this year is going to be another without a significant-sized eruption, the biggest being Pavlof in March which I think just reached the VEI-3 mark. Also the number of M8+ quakes has dropped these last few years, not that it necessarily means anything. You are of course correct. Where did my math go? It may interest you that as we are speaking Momo is retching for all she is worth trying to cough up a furball. I have not given up on a VEI-4 yet this year. I was! Amazing how the thread mixes up between posting and display! We are trying to figure out how that happens. I particularly liked the comment about a ‘super underground volcano’. I mean, are any volcanoes not underground? D’oh. And I who was just being happy that Italy survived The Big One as well as they did. I wish someone could ban UK tabloids altogether. Fear and bad news sells newspapers and newspaper sales bring in advertising revenue. The bigger the disaster, threat or moral outrage, the better. If you can’t find a disaster on a slow news day, then why not create one? The US media has created the Donald Trump phenomenon. It is hard to see how that cannot end in a violent disaster, perhaps for everyone, regardless of who wins the election. A civil war or world war won’t be fun, but it will sell a lot of newspapers. And also would fit pretty well into the current Kondratiev cycle, almost as if it’s right on schedule. The Kondratiev wave is almost a similar cycle to the Strauss-Howe Generation´s theory. The Strauss-Howe cycle also predicts periods of crisis which were the American/French revolutions, the American civil war, WWII and the current decade. Judging by these two theories and by the seemingly cycle, one could speculate that America and Europe can find themselves again in trouble. And isn´t it already? I can only wonder why social behavior tends to repeat in such periodical cycles. The current crisis is still caused by the financial collapse of 2008. People have become poorer and see little chance of improvement, and after a decade of that they have had enough. They are looking for comfort in the past. The UK government is reliving the 1930’s. The US has gone even further back. Look for economic and financial cycles driving the social crises. I would assume that going back to the past is not such a great idea. What do you see happening in the rest of Europe? Also a return to the thirties? I’ve mentioned the Kondratiev cycle thing in the back channel. The part of it that intrigues me, is that each follow-on cycle comes from the follow on technological innovation as it matures and becomes exploited for profit. I haven’t put my finger on what the next one is, but Albert noted that it is likely robotics and automation. Baring some sci-fi like breakthrough, it sounds like the best bet. There are already sushi bots and restaurant bots that custom make any sort of burger you want. And kiosk operations that put pretty most (all) of the minimum wage workers out of work. So much for bleating about raising the minimum wage when a bot can do the job for a fraction of the pre-adjusted wage. Odd fact sort of related to this, a few years ago, a resturant chain found that it could replace most of the drive through window order takers by outsourcing the work to a call center in Idaho. It was so successful, that they spread the idea through most of the US. Keep that in mind when the person giving you your food at the window looks nothing like the voice you heard at the menu sign. The tendency seems Europe-wide but only in the UK has it taken over the government. Note the fragmentation of the political landscape, and the increasing nationalism. You should read Yuval Noah Harari’s new book ‘Homo Deus’ I went to his book signing in London this week, now that was a scary Halloween! No gosh-wow sensationalism, just straightforward, albeit simplified, explanation. And today is the anniversary of the 1755 Lisbon earthquake. Not the largest of most devastating quake, but it is one of the more famous earthquakes in history. It is rare for capital cities to be destroyed by earthquakes and tsunamis (Kamakura in 1293 was probably similar to the Lisbon event). Rare? I do not know if I would say that, Tokyo is not the capital technically but it has been ruined. But, the grandest series of wrecked capitals goes to Guatemala. Cerro Viejo got hammered by both an earthquake and a flood down Agua. Antigua got wrecked twice by earthquakes and the current Guatemala City has also been wrecked twice. So, 3 capital cities wrecked 6 times by 5 earthquakes. Thought you might bring up the country with the worst record on capital shaking. But it was never hit by a tsunami – I think. Kamakura was destroyed by a combination of an earthquake and a tsunami. Cerro Viejo got a lahar dunking instead. And there is always the possibility of it all being covered again in tens of meters of ash as it was during the time it was a Maya capital. I love Guate and my nutty relatives there, but as real estate goes it is a rather dangerous place. I will hopefully spend my retirement there by the sea waiting for a large tsunami to carry me away to the great blue yonder, or for Fuego to come ambling back to the coast again in a big slide pile. Thanks, GL. I never heard of that wrecking but just read up about it. Not sure what to make of the disaster but a gut feeling tells me that design was not a good one for a heavy sea, especially amended and patched up. I sit with the bottoming on shoals theory. That would easily explain the hogging that likely snapped the railings. On a ship, the railings are typically steel cables held up by stantions along the deck edge. Put that under severe tension and they can easily snap or become detached from their fittings on the ends. Shortly before she disappeared, the ore carrier following it reported two huge waves, larger than the rest of the set passing aft to forward (following sea) that were headed towards Fitzgerald. If she were already damaged from bottoming on shoals, that might have been what snapped her in half. It would also explain the fairly wide dispersal of the spilled ore from the rear half of the ship as it went down on the wreck site. NTSB tried to blame the incident on improperly secured hatch covers, but that doesn’t sit with the reported list that the ship had taken on prior to disappearing. In my opinion, a structural failure initiated from the shoaling is a better theory. Seas were reportedly upwards of 30 feet, she normally pulled a 25 foot draft (7.6 meters) and passed over Six Fathom Shoal northwest of Caribou Island. M/V Anderson was maintaining a track on Fitzgerald as both ships were running in company as they were trying to hug the Canadian coast as a shield against the officially forecast NE winds. When the storm shifted winds faster than forecast, this opened up a much longer fetch and allowed the seas to build larger than they would have had the storm system not shifted it’s wind patterns. If you are really into the math of it, refer to “The American Practical Navigator” (aka “Bowditch”) Pretty much anything you need to know about ship navigation can be found in there. Even a good smattering of spherical math. I used formulas from Bowditch to do some of my Canary island plot work. Not really what it was meant for, but it worked when I did my pseudo tomographic stuff. In a nutshell, “Fetch” is the length of open water that the wind can blow across. Larger fetch → larger waves for a given sustained wind speed. Another thing is that on shallow water the wave height differ wildly depending on the depth. As soon as you get a shoal the waves rise up and the through shortens making them into wrecking waves. The Gulf of Botnia where I learned to sail is in many respects quite like the Great Lakes and I quickly learned to steer for deep waters in weather rather than going for safety behind islands. Another things is that a prolonged hard wind will lower the water on the side of the water body that it is blowing from. So, a reef can all of a sudden be a meter or two higher effectually and the currents can become rather interesting. Middle and deep are good words at such places. That might have been what they were discussing back and forth on bridge to bridge radio comms. Between the two skippers, they had 80 years of experiance driving those lakes. I don’t know the internal design, but it was steam powered, and probably had the ability to use the feed pumps to drive eductors in an emergency. It’s not an uncommon idea, and a feed pump can push an obscene amount of water. The only sure thing about the Fitzgerald, is that whatever did them it, happened really really fast. They didn’t even get off a distress call or get a lifeboat launched. The one lifeboat that I know of was spotted days later and showed damage characteristic to having been literally torn off of the ship. It’s an interesting and sad incident. I have two nags on the design, purely personal opinion: firstly she’s long but quite narrow, carrying a seriously heavy cargo with a low freeboard. Secondly the raised castles at either end – with heavy waves pounding on the raised superstructures (particularly the fo’csle) I can’t get the problem of corkscrew twisting along the hull out of my mind. She was welded plate, not riveted. Over time those welds will weaken and without a riveted structure the welds may be stressed beyond endurance for the length and corkscrewing of the vessel..
Yep – add the shoaling chance, which is a very likely event given the route she took and the deep troughs she endured, she could well have disintegrated violently. The images show a pretty clean break about a third from the stern. I see one report reckoned the stern floated for a bit, from the dispersion of the cargo and that does tie with my gut feeling about that pile of superstructure at the fore. Anyway, just my two cents and nothing will bring those guys back. Yes, there is twisting. Nothing is quite as un-nerving as looking down the length of the forklift deck and watching the twist as the ship rides the seas. I was on the 796 ft long USS Seattle for my last tour. A bit larger than Fitzgerald, but a similar structure layout. Superstructure fore and aft, long middle. This class was decommissioned and the Seattle was scrapped in 2007. Military Sealift Command took over the younger siblings (USS Arctic etc.) since they were not as manpower intensive to operate. (Gas turbines instead of boilers) This is good and bad. When we had a fouled tank of JP-5 (aviation fuel) we just had it redesignated as diesel fuel marine, ran it through the dewatering feed tanks and used it as bunker fuel. Boilers don’t really care what the fuel is as long as it makes a good controllable fire. Since the tank had been fouled, it was no longer safe to be used as aviation fuel. Turbines care about such things, boilers don’t. BTW, from what I understand, the contention over the “hatchway giving in” led Gordon Lightfoot to officially change the lyrics of the song. It unfairly points blame at the crew, of which there is no physical proof of the theory about poorly secured hatches. Though now officially a gravesite, prior to that, divers had been down and looked at the wreckage. The forward portion is right side up and planted into the mud pretty hard, the aft section is upside down and just as well stuck into the sediment. The ship is literally broken in half. Whether from events on the surface, or as a result of reaching bottom, is anyone’s guess, though the scattered pellets point to it having been in two parts before reaching the bottom. More on the rift system. I think the midcontinental rift has a lot of similarities with the Parana rift, even down to the amethysts and agates. It also stopped rather abruptly after a spell of rather copious lava production. It almost looks like the Americas were shoved to the west after the initial phase of rifting and the rift restarted east. I would not say that the Paraná failed… The other part called Etendeka is now happily residing in Africa. Yes, but the split did not end up happening up the Parana basin. Etendeka was the southern end of the NNW-SSE rift. It looks like the crust was too thick further north, though there were also some extensive floods in the Amazon basin which are hidden by sediments. The Greenville front is usually equated with it shutting down. That’s when a few extra island arcs and subplates were plastered onto the north American plate as new terrane. 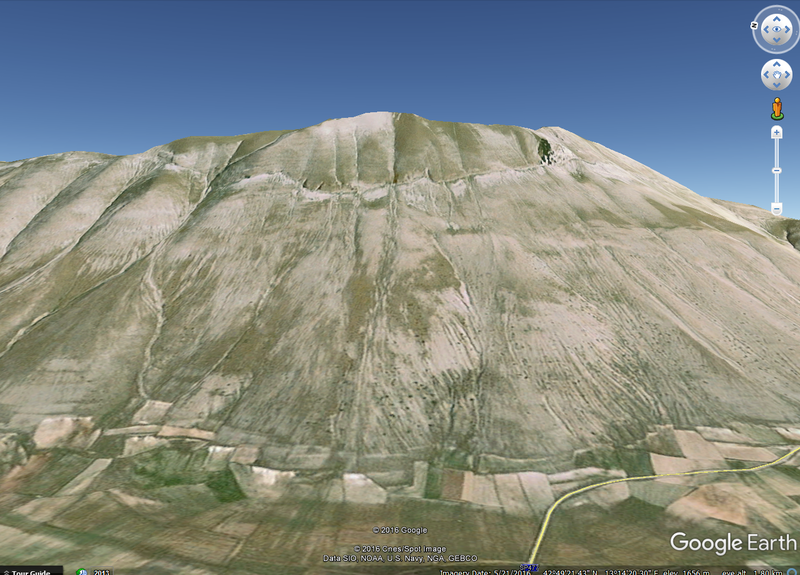 And here is another interesting volcano, and interesting tale of very rapid GPS changes. Ultimately, this turned out to be a failed eruption for now, but the scale of the intrusion here was extremely impressive. I present to everyone Harrat Lunnayir. Wow! This was clearly a failed eruption. Something similar to Holuhraun (albeit a bit smaller) and that almost erupted but it didn´t. In my opinion, it can still erupt in the near future. The intrusion is probably still warm, if new magma manages to intrude again, it could trigger the eruption. Probably the pressure was just not enough, or the rifting was not wide enough to let magma all the way up. When it does it will be the first eruption in recent times in Saudi Arabia. However 2000km2 of 40cm average inflation is a bit more of magma. It gives a total volume of intruded magma of around 0.8 km3. The rupture is not indicate of how much magma has intruded. But in this case, magma has pushed upwards and caused the rupture, while in Holuhraun, a rupture opened along the line of less resistance and magma erupted in the easiest point (at the lowest surface point). Today a few very deep quakes east of Askja, the usual magmatic intrusion. This has been going on for a long time… in my opinion, there will be an eruption there in soon. And a few quakes at Grimsvotn. Seems to be awakening slowly. Question is: when will it erupt? I guess it hasn´t yet reach the threshold of cumulate seismic release. The Vöktun Vatnajökuls graph has the cumulative energy at Grimsvötn a bit far from the eruption “threshold” and also seems to be running a bit late(? ), so my guess is 1-2 years in the future at the current rate. There is though something odd going on with the GPS at Grimsvötn. I will return to this when I have figured out what it may be and get more data. Noticed this as well Carl, thought it must be equipment related but wondered why its showing on the detrended chart, I would have expected this chart to be correct? Check and you will see that the last date on the second plot ends prior to the upshot of the first one. We have discussed this one almost ad nauseam amongst the Admins and we have still to come to a conclusion. We had a 3.3m at 3.7km in the SW rift zone of mauna loa. about 40 min ago. Smack in the middle of the cluster of smaller quakes in that area over the last 2 weeks. That is interesting. A little deeper than recently but still shallow. I had noticed in the last few days that there had been a sudden inflation at the summit (nothing major, but a notable increase). At the same time the extension of the summit had stopped. The two combined suggest a bit of new magma in the summit reservoir, a few km down. Some people see science as an asset. And some see it as a threat. @Albert When I count correctly there are already 9 telescopes up there? So the fuss is about adding a 10th? Really? Mauna Kea is a special place to the Hawaiians. There was an agreement with them on the number of telescopes that can be put up. Some liberties have been taken with that, for instance the Keck-2 telescope was claimed to be part of Keck-1 and therefore shouldn’t count. That probably didn’t help. More emphasis could have been put into keeping the observatory part of the local community, rather than something that benefits people far away. But basically, people wanted a stick to hit the government and the observatory provided a suitable target. It became collateral damage. In the past, the local people would have been proud of science done in the local area. Now to some it has become an enemy. Science touches on things it can be more convenient to deny. The UK is still ok, even with an unusually far-rightwing government, it is pro-science. But the even-further rightwing UKIP party is anti-science, and in this way closer to some of the fringes of the US political scene. Maybe science at times has picked fights on things outside of its remit (Dawkins being a prime example). But it has also become an easy target for people who push their message by creating an enemy. The Hawaiian problem is made worse by a growing anti-science culture. But I also get nuts, when somebody tells me that these scientist have no idea, that pseudobraniac over there proved them all wrong “scientifically”. Guy I know was quite huge and the fastest way to get on his bad side was to infer that he was native to a different island people. I’ve seen people treated like potted plants by him for making that mistake. It was looked at at one point for a major observatory. Mauna Kea and Chile were the better sites though. I believe that the cloud cover is considerably more at Piton des Neiges. The name is also not promising although I believe it is a bit exaggerated. Thanks Albert for a great read and also to Carl for your mentioning of us newbies and keeping things to an understandable level. Having only been educated to secondary school level in England I often find articles heavy going but you guys really help me at least gain a basic understanding of whats going on even if the science and charts are a bit much. On here at least once a week and learning so much about a subject that has fascinated me since a child. Love this site and thanks for not putting us of a lesser understanding down. Thanks again to all who contribute. Can you show the image, dragons? I think there was some discussion here about this over the summer when the article originally came out. It seems the news agency decided to regurgitate this again after the earthquake to capitalize on fears. It is a beautiful place. 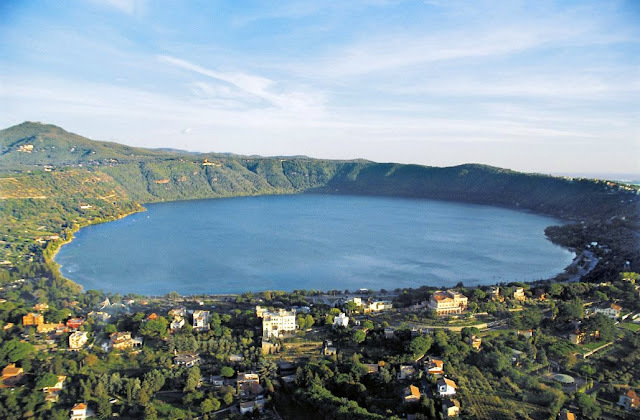 I remember Nemi, with a fantastic view over the smaller volcano lake. An inflation rate of mm per year is nothing to worry about. Mauna Loa had 10 cm in the past week. That would have taken the Albans a century, at the current rate. It’s not a ton, but it does state that the volcano is active, which could be relevant for the future. GEOLOGISTS are investigating Mount Vettore in Italy after a ten km crack has been spotted and fear the deformation could lead to another huge earthquake. And a side note: “Quake Lake” in Montana was formed from a mass wasting event following a nearby Mag 7.5 quake. As for the photo in the article, it seems to match a scarp visible in Google Earth from 2016 imagery… through the one in the article’s photo seems more apparent. This is the Google Earth version, see the article for comparison. I saw that on Italian TV. Quakes have made whole rivers disappear, like the Sarasvati River in India, or change the run of a river. 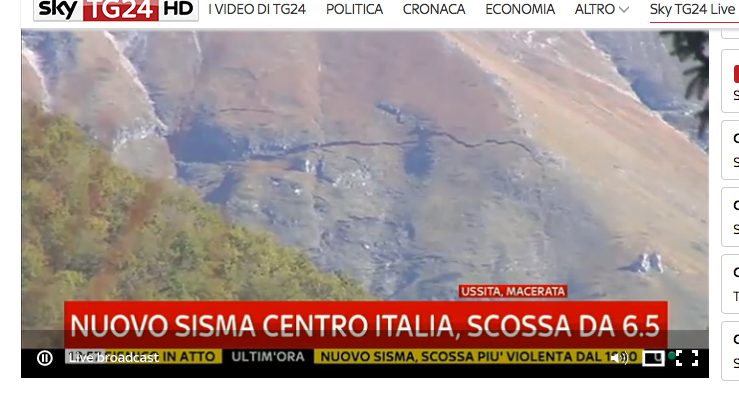 Something about the Vajont disaster is vaguely reminiscent of the blame game after the L’Aquila quake – some things just do not change in Italy. “Throughout the summer of 1960, minor landslides and earth movements were noticed. However, instead of heeding these warning signs, the Italian government chose to sue the handful of journalists reporting the problems for “undermining the social order”. It may sound flippant, but the only 100% certain way to survive, is to not be there when it happens. I survived the 1989 Loma Prieta earthquake by not being anywhere near it. Off topic – the return of an old friend? I would like to know if it was travelling from east to west as it was my theory that this or another group of (pretty large) rocks was on an elliptical orbit and likely to return periodically. The one I tracked from online reports across Europe, Ireland, Nova Scotia and Massachusetts in September 2012 appeared green when viewed from northern latitudes and orange when viewed from further south. I had hoped that the Chelyabinsk landing had seen the last of it…. These may be precursor earthquakes to a bigger M5+ earthquake in the Sprungur along the Southern Iceland Seismic Zone. Interesting, why these in particular? They are forming the same type of lines along the same direction as occurred before the 2000 and 2008 earthquake fore-shocks. That being said it is equally possible that nothing happens. Ah, I see. Thank you. Hope the bridges over the Hvitá / Ölufsá and the Þjorsá are in good order. Chile just had a M6.1. Quite normal for the region. Wake up Kona! Some of the resorts on the west coast may have felt this. There were also 3 others with in 2 hours none of them on the summit. Hard to say when not knowing the frequency from a spectrogram. But, my guess would be weather related. * TIMING…THROUGH EARLY SATURDAY MORNING. Lets just say that a 12 gauge with full choke is not the optimal weapon at 30 feet when squirrel hunting… even with bird shot. A small piece about the current unrest at Hekla!